River cruises are almost obligatory in much of the Amazon rainforest since just to get to your accommodation you will most probably have to take a boat! 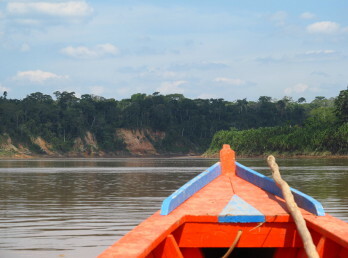 A few lodges in the Tambopata area in the southern Peruvian Amazon are located under an hour from the closest town, Puerto Maldonado, and can even by reached by land but most are inaccessible by land and can take several hours to get to by boat. 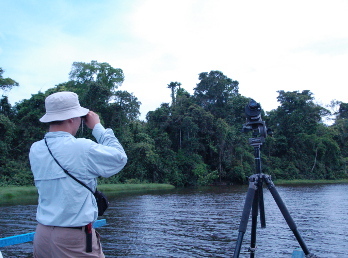 But for many visitors, cruising along the beautiful rivers, oxbow lakes and creeks in the rainforest is actually one of the most memorable experiences of their trip. Cruises are relaxing trips on small, motorised boats on the rivers and on non-motorised canoes in the oxbow lakes and palm swamps and are led by specialist nature guides. The two main rivers in this area are the Tambopata River and the Madre de Dios River, which are tributaries of the great Amazon River and flow up to the eastern slope of the Andes mountain range. If you are fond of fishing, some tours here include fishing trips, on which you can try your hand at catching some of the fascinating Amazonian fish species here, including huge Arapaima fish and piranhas. These rivers provide habitats to one of the world’s richest ecosystems in terms of biodiversity. Some of the aquatic wildlife species you might see here while on river cruises include various that are endangered such as the Giant River Otter, Pink River Dolphin, Yellow-Headed River Turtle and the South American River Turtle. Other more common aquatic species here are Capybaras and two kinds of caimans (the Spectacled Caiman and the Black Caiman). You are likely to see some of the countless bird species living here too while on your cruises, such as Amazon river birds like Ospreys and Neotropic Cormorants. You may also see parrots or macaws feeding on trees by the water but the best places to go are the world-famous clay licks in this area.